Though a contemporary of the Impressionists, Redon was one of the first artists to reject their scrutiny of optical effects in favor of exploring his own imaginary world. For the portrayal of his inner visions, he was admired at the turn of the century by the French Symbolists and by the Nabis, who sought to uncover the hidden aspects of life. Later, between the two world wars, the Surrealists hailed him as a forerunner. His strange and fantastic images are usually limited to one figure or object, often a winged creature, as in The Wing. 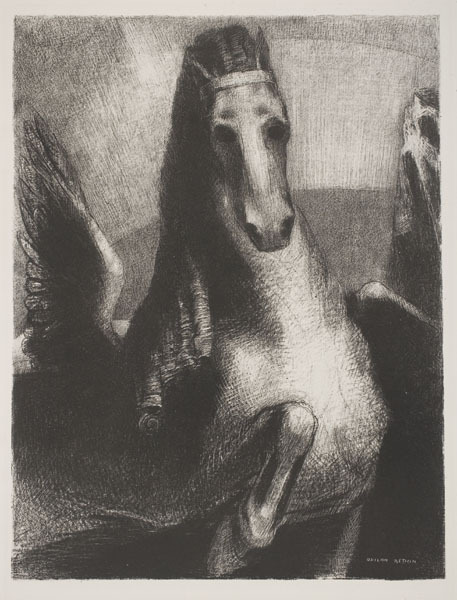 The flying horse depicted in this print is a frequent subject in his graphic work; several of his lithographs show Pegasus, the winged horse of Greek mythology. Early in his career Redon renounced color and challenged himself to exploit the possibilities of charcoal, as he found it to be a medium that liberated his imagination and allowed him to focus on gradations of light and dark. To reproduce his drawings the artist turned in 1879 to lithography, attracted by the tonal effects that he could achieve with this printmaking process. During the next twenty years he worked chiefly in black and white, making over 170 lithographs. Only in the 1890s did he gradually give up monochrome, creating brilliantly colored works first in pastel, then color lithography and (after 1900) oil.